An avid dog training enthusiast since childhood, Lori has been dedicated to the sport of agility over the last 13 years by competing at national and international events, as well as instructing classes and seminars throughout the US. I really enjoyed the set-up I designed for classes this week. It offered a lot of opportunities for different challenges I used in all of my competition handling classes (from Beginning Comp to Extreme Agility). The first course I set for the Advanced Comp Class (the Beginning Comp class had the same course, but did straight from 6-8, not taking the #7 jump before the A-Frame). I have had a great time with my Online Coursework Facebook group! 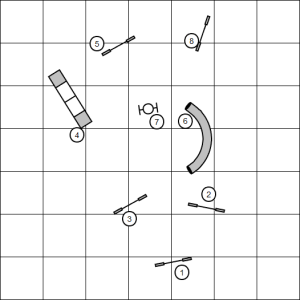 Every 2 weeks I post a set-up with 10 exercises, ranging in skill level so there is something for everybody, in addition to gambler and snooker challenges. I usually share demo video focusing on a few sequences and handling options (not all of the options, I love having others comment that they tried something different and post their own video! ), while subscribers share video for me to analyze and everybody discusses what worked for them, what was difficult and advice to help each other improve. What a fun, sharing and learning environment! Backyard Training – Keep it Simple! Many of us have some amount of usable space to practice small exercises at home with our dogs. Even with a number of indoor agility training facilities in our area, I can't emphasize enough how supplementing your “formal” training time with practice at home is so important. The more you can focus on small things (isolating and reinforcing individual skills such as stays, call to heel/hand, timing and placement of cues, etc), the stronger your teamwork will be with your dog. The shorter the exercise, the more often your dog will get reinforced, too! Also, I enjoy the challenge of working small sequences and practicing every single handling option. Serps, Threadles and Push-throughs. Oh My! Last night I taught a workshop on handling serpentines, threadles and push-throughs. The participants had already attended a class on the introduction of these skills, where we worked one or two skills at a time, so everybody was ready to be pushed a bit more! The drill I devised was a spin-off of the traditional straight line of jumps. By curving the line, it varies the challenge a bit and offers an increase in difficulty when the handler has to work the jumps from the “outside” of the curve. It doesn't matter if you use wing or wingless jumps (a variety is great). I also recommend playing with expanding or decreasing the distance between jumps. The first objective is to serpentine the jumps, ideally down and back along the line. Keep in mind that this should be a “no-brainer” to you and your dog. Yes, you cue the line, but shouldn't overly have to work or hold to get your dog to come into you over a jump or push out to take one away from you. Next, try threadling between the jumps. This means your dog is going to take each jump away from you. Things can get a little tricky at this point, especially when you are trying to get down the line. The best advice is DO NOT rush sending your dog back to the jump. If you make the dog's line too effecient, then you risk getting too far behind and threadles are mostly successful when you stay ahead of your dog's path. This is an example of a place you might have your dog take a little longer line if it allows you to remain proactive and keep them on course further along the line. I am showing the path in black going one direction and red coming back. Last week I posted this set-up for the Competition classes I teach in Kansas City. Normally, I will use set-ups I have had in class when I teach seminars. This time, I decided to bring some game drills I used in recent seminars back to my classes since we had so much fun with them! The basis of this drill uses the ladder set-up from my previous blog which can be seen HERE. Warning! These games are not just for those who compete in USDAA or similar organizations offering snooker-type games classes! I wanted these exercises to emphasize the importance of balance in respect to the dog being in handler vs. obstacle focus. Also, it teaches the handlers to create smooth, efficient paths for the dog when given the task of planning their own courses. Think of it as brain games to improve our agility neuroplasticity! Enjoy!